Over 55,000 women are diagnosed with breast cancer each year in the UK, with nearly 1,000 dying every month from the common cancer. Success rates are relatively high in breast cancer, with 78% of those diagnosed with breast cancer living for 10+ years after initial diagnosis. Chemotherapy is the most commonly used treatment for cancer in the UK, but some patients are now choosing not to suffer under the notoriously detrimental side-effects that comes with it. One of those brave women is Fiona Russell, a British physiotherapist. Fiona exclusively shared her amazing story of self-treatment with cannabis and meditation with us, in the hope that it may inspire other cancer patients to take their destinies into their own hands. “I found a lump in my right breast towards the end of September 2015. I never thought that I would find a breast lump and so suddenly. One day it was just there. “I didn’t immediately go to my GP. I went in November after a trip to Bali, and although I told him I wouldn’t take orthodox treatment, we decided that it was best to have it officially diagnosed anyway. “I went in to have test done in December, expecting to get the results at the end of that week. “After the test, I was then put in a consulting room to see the consultant. She came in, barely introduced herself and said told me to ‘expect the worst, as it looks like the worst,’ and walked out. “I was stunned. What kind of person makes that kind of statement to a patient? “One who obviously has no clue about the placebo and nocebo effect. This is what makes me very cross about the NHS. “Some medical professionals seem to be oblivious to the nocebo effect, and their position of responsibility in the well-being of their patients. “The following Friday, I sat in another consulting room waiting for the results. The same consultant came through a side door, accompanied by another lady who I presumed was a nurse. “I did manage to say I would be happy for them to follow my progress, having worked in the NHS and respecting the establishment. “The nurse told me this wasn’t possible. “I went to my car and sat for a moment, had a little cry and decided that was the last time I would allow myself to be pushed into victimhood and I would continue with my healing, the journey I knew I had started on some years before. “We have the power of self-healing within us. Medical cannabis offers patients the choice of self-determination. Chemotherapy has a notoriously detrimental impact on people’s health. While it has a relatively high success rate, especially in breast cancer, the toll it takes on patient’s mental and physical health is one of the main reasons many choose medical cannabis instead. “2 years before my diagnosis, my mother’s partner’s daughter, who is a little younger than myself, was diagnosed and had opted for the usual Chemotherapy option. “I had wanted to send her information on alternatives because I knew Chemo and Radiotherapy therapy were not a good option. “Anything that knocks out the immune system when you are needing it most was ridiculous to me. “Now I see it as abusive! “I believe that not too far in the future we could see people actually suing the NHS for abuse as the truth is simply being ignored. “I first discovered medical marijuana on my social media feed around 6-8 years ago, mainly via Rick Simpson’s story. I also took an interest in Bruce Lipton’s research on Epigenetics and spontaneous healing. “I had taken up a bioenergetic mediation practice in 2009, and noticed as a physiotherapist how patients physical symptoms were driven by their emotional state and belief system, i.e. if a patient believed they could get better, they would, if they didn’t, they wouldn’t. “I decided I would use Cannabis, if it was easy to get. “I knew I didn’t necessarily need it with my practice, as I know how powerful bioenergy mediation can be. I know many who have overcome chronic illnesses such as HIV, Hep C, Cancers etc simply with this practice. “Ironically, I had lived in Colorado for 12 years up until 2006, where cannabis is now legal. “Though my research, I knew all about making the oil, dosage and different ways of taking the oil for best deliverly to different parts of the body. “I knew about the expense of growing and the cost of buying. “I contacted the Cannabis Campaign groups of Hampshire, Dorset and Wiltshire and almost immediately had a response from the Hampshire group,” Fiona added. “Shortly after this I was told that somebody had donated a plant for me. “In the new year I went to talk to 2 of the members of the Cannabis Campaign group. “I went a second time with a friend of mine from my meditation practice who had already healed many spinal tumours through our practice and just had 1 tumour left in her brain. “We were shown how to make the oil and sent home with a couple of capsules to try. “I took them that night, noticing a slight achy head in the morning. “We were also shown shown a growing room with hydroponics tent, etc. But I decided it was all too complicated to set all that up. For most patients, growing cannabis can be dangerous or too difficult to get right. While Grow Your Own (GYO) is an integral part of our legalisation effort, it needs to be recognised that this may be impractical for some patients. Campaign groups like Hampshire help fill the gap, helping to grow cannabis for those who cannot grow their own. More importantly, they also guide patients in making their own oils, tinctures and capsules, helping them become semi self-sufficient. “In May 2016 a friend contacted me and said he had some cannabis seedlings, asking if I wanted to come and collect some from him to grow for myself outside. “I asked him if he could keep them until my return, when I collected 4 from him. When patients are unable to obtain legal medical cannabis in the UK, or elsewhere, often they are forced to flea to countries where legal cannabis is available. “While in Colorado I was able to try some edibles to see what reaction would be. “My lawyer directed me to a Cannabis Centre in Tabernash. They were very professional. “I had to give my passport, and because I had no medical Marijuana card, I was only allowed to choose from the recreational products. “They assured that they could give me the information I needed about the edibles to help choose which to buy. “I bought some lozenges for focus, and a tincture to help me sleep. However, I was reluctant to try anything before the divorce hearing. “Not wanting to waste the lozenges, I gave them to a friend to use for menstrual cramps, which she reported helped her a lot! “I did try the tincture on the way home, putting the remains of it into a smoothy that I was going to drink on my way the airport. “I continued in the hope that I would be seen to have a legitimate reason to be growing them. “Mid-August I had another trip to Bali. On my return in early September, the plants had grown to 6.5 foot tall and were the most vibrant plants I had ever seen! “I had literally done nothing to them, while the tomatoes beneath them were black and dead! “So now I had to watch them and be ready to harvest them. “I borrowed a book from my nutritionist on how to grow cannabis and followed those guidelines. “I first tried some by plucking a bud and sautéing it up in coconut oil and mopping up the green oil on some nice seeded sourdough bread. “I harvested the cannabis plant when the buds showed rusty coloured stamens. “I cut stems, dried some and clipped leaves and buds and froze them directly. “I noticed resin on my fingers just from clipping the leaves, so could see they were potent as well. “I blended the cannabis, adding coconut oil, freezing in flat tubs so that I could easily cut a cube from it to use when I wanted. “I’m only now just down to the last tub of that, a year and a half later! 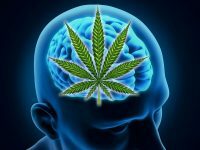 “To start with, I didn’t want to use it too often as it did give me a sense of loosing control which was hard for my mind, so I used [the cannabis oil] every other week, int he late afternoon so I could use it as a tool with my meditation. “It worked well and I could see the benefit after having taken it. “I gradually built up my tolerance to it. It was always a nice experience taking it. “I found that if I cooked cannabis, it really helped my focus and connection and that my mind could let go. “So I would cook it in the evenings and have it raw in the mornings in my smoothies. “I had a thermal image done in January 2016 after I was diagnosed. “It showed level 3 at the site of the lump. 6 months later it was level 2 (1 and 2 are normal). “I decided not to have an image this year, but the lump feels as though it is dissolving. “I have felt like a criminal for using medical cannabis at times. “I don’t so much now, as things have changed so much in the past 3 years. While progress has been made over the past few years for medical cannabis, that progress is rather limited. Even though the Conservative Government ‘legalised’ medical cannabis in November 2018, only a small handful of children have been granted legal prescriptions. “Others may need help knowing how to use it for themselves and I am happy to help, it has helped me so much. “Because it wasn’t the usual way to do things, I was unable to really share much about it apart from the progress, as it has happened bit by bit. While cannabis was a key element of Fiona’s cancer treatment, it was only a part of it. “I already had a healthy diet. I’ve been an athlete all my life, and a physiotherapist working in the field for 30 years, so I had a pretty good overview and training in orthodox and alternative treatments including energy medicine (acupuncture, Shiatsu, Meta medicine, etc.). “I had already started taking raw Turmeric and Frankincense oil, eating plenty of raw greens, etc. “I decided I would take up riding, since I felt with all this going on in my legs I couldn’t really run fully. Stories like Fiona’s highlight just how important it is for further legalisation of medical cannabis in the UK. Criminalising patients does not prevent them from using cannabis, it only makes it more dangerous for them to access; often forcing them to interact in the black market. Fortunately for Fiona, she was able to find help in one of Britain’s growing network of cannabis groups who are risking their freedom to save lives. The British Government and medical profession should be taking a more compassionate view of medical cannabis, especially due to its non-lethal status (it is literally impossible to die from consuming cannabis). Help us raise awareness of medical cannabis by sharing this story. If you have your own medical cannabis success story, we would love to hear them in the comments below!